I joined a middle years math community organized by my school division. I have a growing interest in the transition of students from middle school to high school because many of the tasks I use or create get at middle years content. I’m wondering what knowledge students come to my room with and what atmosphere it was learned in. Both have huge impacts on how students operate in my room. 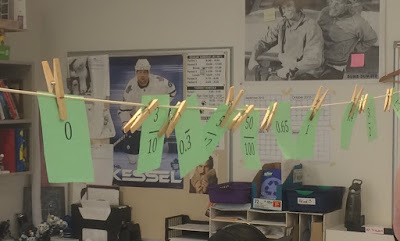 I was surprised to hear that middle years teachers lamented that students could not use number lines. 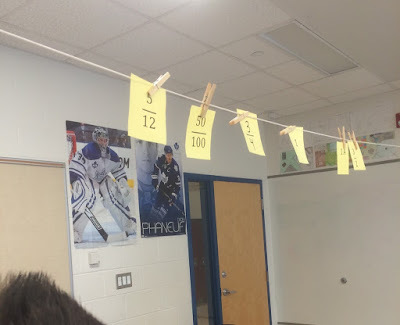 I use number lines as a support in my high school classes because I (ignorantly) assumed that this was an accessible tool from their elementary days. As it turns out, what I thought was making things easier for kids to conceptualize, probably was causing cold sweats and night terrors. Typical day in the office for me. When Andrew Stadel blogged about clotheslines I had to investigate further. It wasn’t long until my intern and I had retractable clotheslines attached to our walls. I refined the resource creation process by using PowerPoint and then saving as a .pdf with two slides per page. 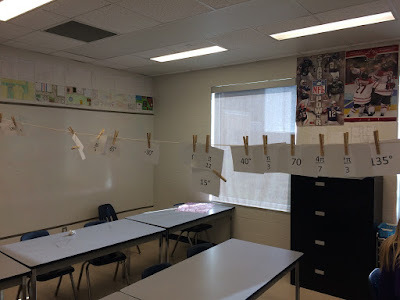 I then brainstormed several situations where number lines would facilitate useful mathematical reasoning and discourse. They range from early grades to pre-calculus (with the ordering of radians and degrees). The complete “series” of slide sets is below. They include a brief instruction slide. My hope is that they are ready to print, cut, and use. 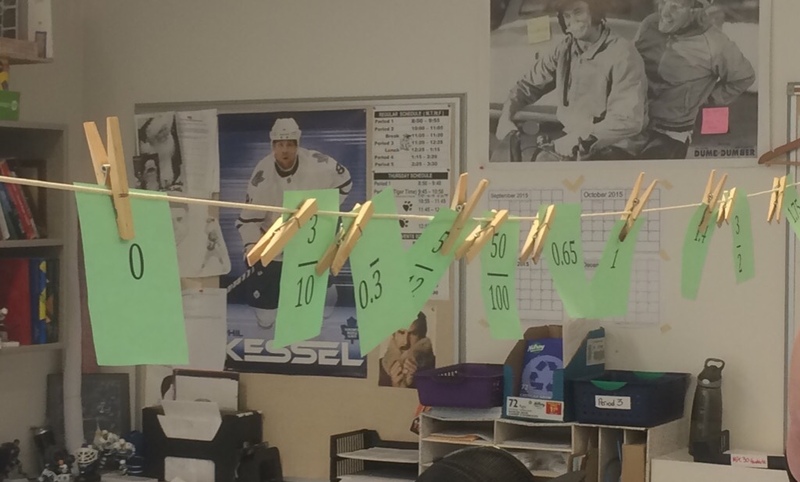 I installed clotheslines onto my walls, but writing the line on the board or tacking a string across a wall would work as well. Sometimes I started by placing a few referents, but as they got better, I allowed students to begin conversations by placing the referents. I then handed each student a number one-by-one and asked them to talk through their reasoning as they pinned it to the line. Students were free to interact, but not interrupt. The key is the attention to reasoning and stress on mathematical communication. If I give more than one student a value at a time, it becomes a collection of independent (and silent) reasoners. I want students to argue about issues like sequence, scale, inverses, distance, etc. 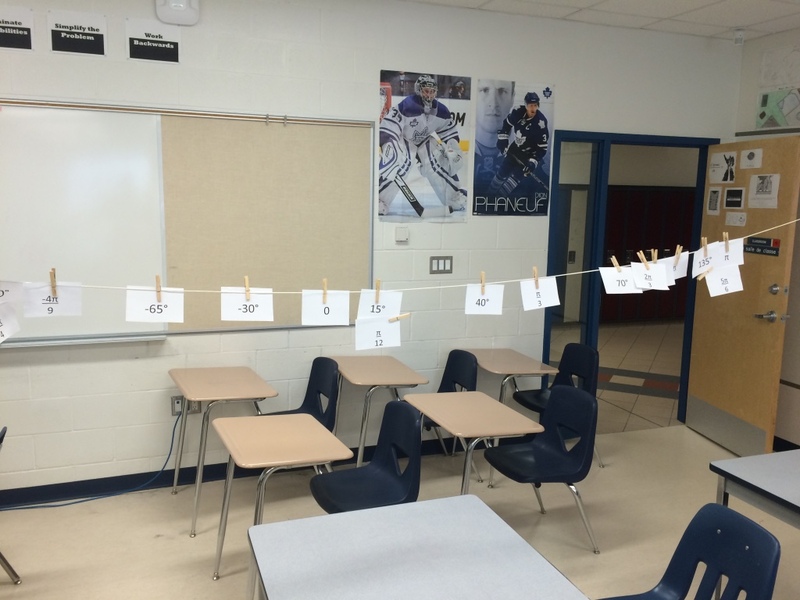 I ran two clotheslines simultaneously with a teacher asking questions alongside each. Print extra blank values, and have students pair up and write a value for their partner to place. As an exit ticket, give students a value and have them write to you where they would place it and why. (I use journalling and portfolio work regularly in class, but a stand alone activity would be great also). Change the scale by moving a couple referents. Ask the students what would happen and to adjust the values. Any other curricular topics, classroom structures, or extension ideas are welcome. I’ve found that the impermanent nature of the placement encourages sense making, mathematical talk, and risk taking. Any activity that checks those three boxes is great at any level.